In 1973, the historic dinosaur quarries on the Dakota Hogback were designated a National Natural Landmark, the Morrison Fossil Area. This honor remained virtually unknown to the public until a plaque was finally dedicated in May 2004. 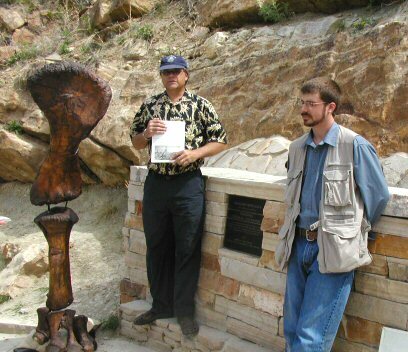 The plaque was placed by National Park Service personnel on the interpretive area at the site of Quarry 5, where bones of Stegosaurus were discovered in 1877. 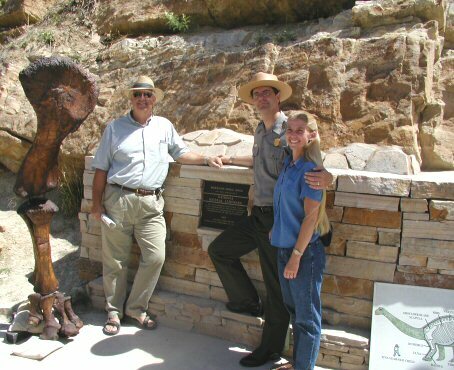 Today, of course, we know the area as Dinosaur Ridge, and it is managed and interpreted by the Friends of Dinosaur Ridge. See also waymarking.com at their historical marker, or at their NNL page.